Where can I view information on all of the Amtrykes and accessories? 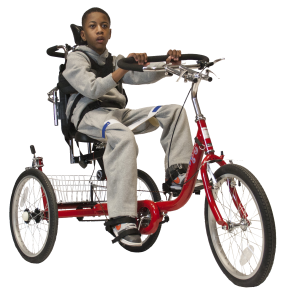 How can I get an Amtryke adaptive tricycle for my child or loved one? What do I need to fill out to get my rider on the Wish List? What is the wait time for Wish List requests? Where can someone try out an Amtryke? Why would these trykes be any better than one at a regular retailer? Can the trykes be adapted further? What if I just want to go ahead and purchase an Amtryke or get a quote? How are the trykes shipped? Can I return the tryke? What if I don’t get everything I ordered? What is a ‘backorder’ and what does it mean for me? How do I assemble the tryke? What kind of company are you, anyway? What if I have a question not covered above? The most up-to-date information can be found on www.amtrykestore.org. Or you can view the latest Amtryke catalogue. You can email the link to whoever else is interested. We recommend that you first view our chapter directory to you see if there is an AMBUCS chapter in your area that may be able to help you acquire an Amtryke for your rider. If not, you can still get an Amtryke one of two ways: You can either purchase a tryke through to the Amtryke Store or, if you are unable to afford the cost of a tryke, you can place your rider on our Wish List. When a person with challenges to mobility and independence would benefit from an Amtryke does not live close to an AMBUCS chapter and is need of charitable assistance, they are eligible to go on the Wish List to wait for funding for their tryke. In order to be placed on the Wish List, all three required documents must be filled out and returned to the AMBUCS Resource Center. More information. There are three forms that must be filled out and returned to either your local AMBUCS chapter or the Resource Center (but please not both). More information. Wish List requests are filled as AMBUCS chapters, the national organization or the potential recipient raise funds. Generally, wait time is three months to two years. This may lengthen or shorten based on availability of funds. There are over 200 Amtryke Evaluation Sites across the United States. You can find if one is near you visiting our online Evaluation Site list. Click on your state and browse the available sites and contact information. Call the contact person and ask for an Amtryke evaluation. They may or may not waive the co-pay for the visit. If there isn’t an Evaluation site near you, take the request and waiver form, assessment form, and tryke selection form to your child’s therapist or physician. Don’t worry, thousands of therapists unfamiliar with the Amtryke have successfully fitted riders to them using the Assessment Form and Sizing Chart. More information. Unlike bikes or trykes from a regular retailer, most of our bikes employ a fixed drive, or ‘fixie.’ The fixed drive doesn’t allow coasting so whenever the tryke is in motion, the pedals are in motion for full therapeutic effect. It works on a mechanical level to help a child make a full pedal rotation. It also allows the stronger limb(s) to help the weaker limb(s) and build strength and stamina. We make classic foot pedaled trykes, ones that can be peddled with just the hands and others that are pedaled using both hands and feet. Yes, while the trykes in their standard form will work for many riders, we realize that others require further adaptations for the tryke to work for them. Amtryke has developed an impressive array of adaptive accessories to further suite a tryke to a rider’s needs. You can check these accessories out at the Amtryke Store. Not everyone needs a charitable intervention and we know waiting is hard! When ordering, please provide Amtryke with your name, address, phone, and email address as well as the recipient’s name and the address the tryke should be shipped to. Existing customers will be asked to verify shipping and billing information to insure proper delivery. To order, visit www.amtrykestore.org or contact Roxanne at roxannen@ambucs.org or 800-838-1845 x116. Amtryke accepts payment in the form of Visa, MasterCard, or American Express. Please allow 3 to 5 business days for order processing. Terms are C.O.D., cashier’s check, Visa, MasterCard or American Express credit cards. An account can be established upon approval of your credit application by our finance department. Returned check fee is $35.00. Freight Terms: Shipping and handling will be billed on your invoice. Please contact us for shipping and handling fees for each tryke model and accessory. Customers using their own shipping account numbers will be accessed a handling fee. As a default, all orders will be shipped “best way” as determined by our shipping department to ensure prompt service and a fair price. We can expedite your order by shipping next day, second day, Saturday delivery, etc. according to your specific instructions. However, these special methods DO NOT qualify for any freight allowance. Generally, Amtryke tricycles and accessories are shipped via FedEx Ground. No returns will be accepted without prior approval from Amtryke, LLC. Please contact 1-800-838-1845 x116 for return merchandise authorization number (RMA) and shipping instructions. Merchandise must be sent back within 30 days, in pristine condition. Amtryke will not be responsible for fitting/ evaluation errors. If you wish to return merchandise for exchange or credit, disassemble the item and pack it carefully in the original container (when possible) to protect it from damage. If the tryke is damaged due to poor packing, we will not be held responsible. Insure the shipment. Claims for damages must be made within five (5) days of receiving the merchandise. If you decide to cancel an order or return an item that has already shipped, or refuse an item once it arrives to you, you will be charged the freight and handling fee. A restocking fee of $50 is charged for returned goods. Claims for shortages must be made within five (5) days of receiving the merchandise. Before calling to report a shortage please make sure you have opened and thoroughly inspected ALL cartons and packing material against the packing slip that is on the outside of the box. All orders are inspected by two staff people before being shipped but mistakes are occasionally made. There is at least a 6 month delay between us placing the order with the factory in Taiwan and receiving it in North Carolina. To save money and reduce rider wait time, we order trykes in bulk and in advance. In other words, we don’t wait till the tryke is paid for before ordering it from the factory. Sometimes the crystal ball (really, a complex mathematical formula) fails us and we do not order enough of a certain tryke or accessory. Past sales performance is not always a predictor of future performance. The most popular models often shift unpredictably. We do not hold orders unless specifically requested. Backordered items are shipped as soon as they are received. Your order may be split into multiple invoices to allow us to fill your order in the timeliest fashion possible. We do our very best to prevent items from being oversold. However, we have to gauge demand six month or more in advance and, again, sometimes the crystal ball fails. We ship trykes un-assembled (the cost to ship them assembled would be prohibitively high) and we do not employ representatives to put them together for you. Assembly instructions are included and we also provide instructional videos. In general, the smaller the tryke the easier to assemble. Feel free to contact us if you experience difficulties. Please take a picture or two of the problem and email them to us along with your question. This will make the process much quicker. If no one feels comfortable assembling the tryke, we recommend you enlist the help of a local bike shop. We are a nonprofit. Please be patient with us. Keep in mind we are a very small shop with a paid staff of ten. If you are working with your local chapter, please remember that whoever you are talking to is spending their time and talents to inspire mobility and independence out of the goodness of their heart and are not being paid. If you have an unresolved issue with a chapter and have made every effort to reconcile it, please feel free to get in touch with the AMBUCS Resource Center. But be aware that each chapter has the discretion to choose its projects, its recipients and to what degree they help. We are not a durable medical equipment company; we are a nonprofit organization. We do not have paid representatives around the country; we have dedicated volunteers. Both of those elements keep the cost of an Amtryke down and make it possible to serve far more riders…but they also sometimes cause frustration in riders, parents and therapists. We do not have the ability to accept medical insurance. Some of our dealers do. Contact Roxanne for dealer names at 800-838-1845 x116 or email her. Sometimes CAPC will purchase all or a portion of an Amtryke. We can provide a quote for CAPC but the rider/parent will need to do the legwork between us and them. If you have any other questions not covered above contact us at 1-800-838-1845 or email us at amtryke@ambucs.org.